US 93 leaves I-15 north of Las Vegas and sets off along one of the many wide, empty valleys that run north-south in Nevada. 490 miles later the road crosses into Idaho after passing largely similar scenery for much of the way. A few times the route climbs over a ridge into an adjacent valley, and occasional towns interrupt uninhabited sections of up to 80 miles; mostly, though, the road is straight, and the surroundings relentless, but still scenic. The southern half is the most interesting, passing a variety of geological features and vegetation zones, and the 149 miles between Ash Springs and Majors Place are designated a National Scenic Byway. 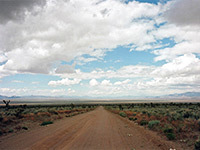 From I-15, the byway starts with a 50 mile straight section between two facing ranges of gaunt, rocky mountains - a typical scene in Nevada, then follows a small stream along the Pahranagat Valley to the town of Ash Springs. Behind a range of hills to the west lies the huge, secretive Nellis Air Force Range, chief location of the US aircraft and missile testing programme and home of the mysterious Area 51. A right turn near the junction with NV 375 leads across the cacti- and Joshua tree-covered Delamar Valley, then up a twisting canyon in the Delamar Mountains to Caliente, a settlement of about one thousand people. The town is centred around a large, Spanish-style railway station - one of only two of such structures in the Southwest, the other being at Kelso in the Mojave National Preserve; both communities were established around rest stops on the Los Angeles-Salt Lake City railroad. Many buildings date from the 1920s, and the atmosphere is peaceful and picturesque. Beyond Caliente, US 93 stays in the mountains for a while, passing close to Pioche, another historic old village, situated in an interesting area with several ghost towns, many old mines and a few state parks, including the curious eroded landscape of Cathedral Gorge. Another lengthy straight section completes the drive to Majors Place, where the road looses its scenic byway status. Just a few miles to the east rise the permanently snow-capped mountains of the Great Basin National Park, although the park entrance is on the far side, 40 miles drive away. The remainder of the long journey north to Idaho is generally less scenic and sometimes monotonous, as the land becomes gradually higher and more forested. The main towns with hotels along highway us 50 in Nevada are, from south to north, Henderson, Las Vegas and Ely.